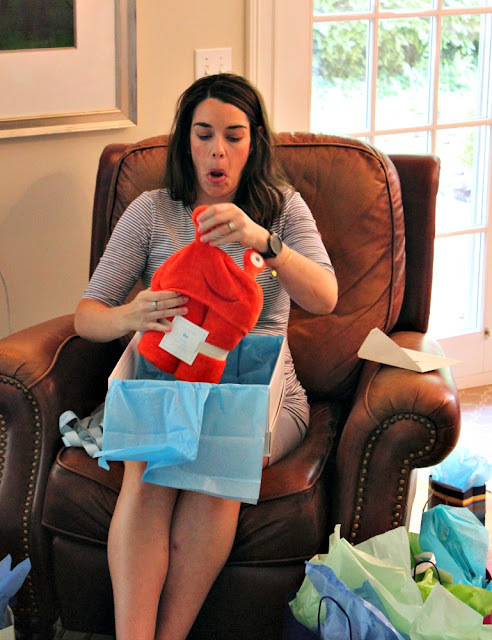 Last week I was so busy telling you about bottles and zucchini (and growing a child, ohh it's exhausting sometimes) that I forgot to tell you about our first baby shower! I've mentioned that I changed jobs last fall but I have been fortunate enough to keep in contact with my old coworkers. They are a great bunch and reached out to Mister and I and offered to throw us a couples baby shower. It was SO sweet of them and we had the best time. It was so great to see everyone at once and celebrate Little Mister. 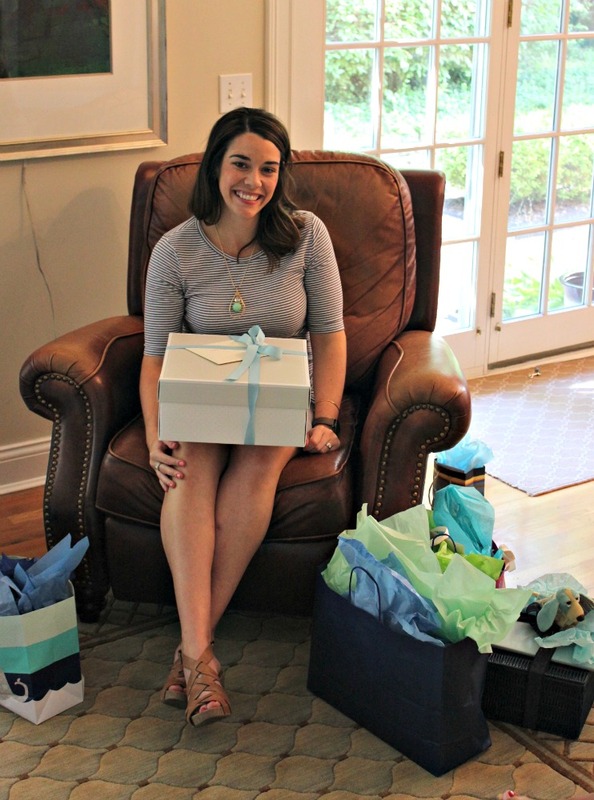 The host, Jay, put together one of the best baby shower games I have ever seen. It was perfect for a room full of designers. Jay gathered plain onesies, paint, markers, stamps and craft supplies galore. He then gave everyone 30 minutes to design the best onesie. It was a mash up of Chopped meets Project Runway. At the end of the 30 minutes we voted on the best one. I almost hated to give it to him, but Mister walked away the winner. His onesie said, 'Eat Local'....it was too funny not to give it to him. 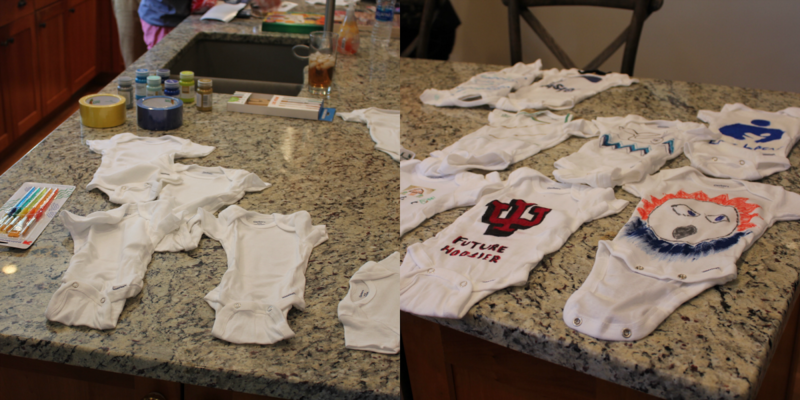 We were given a lot of very sweet and adorable gifts. Hooded crab towel...how can you NOT make that face? Baby cardigan, just get out of town. Floyd even walked away with a few things and Charlie the Ranch dog books to read to Brother. Overall for our first ever baby shower it was so fabulous and we are so thankful to be surrounded by such sweet and supportive friends. How cute!! 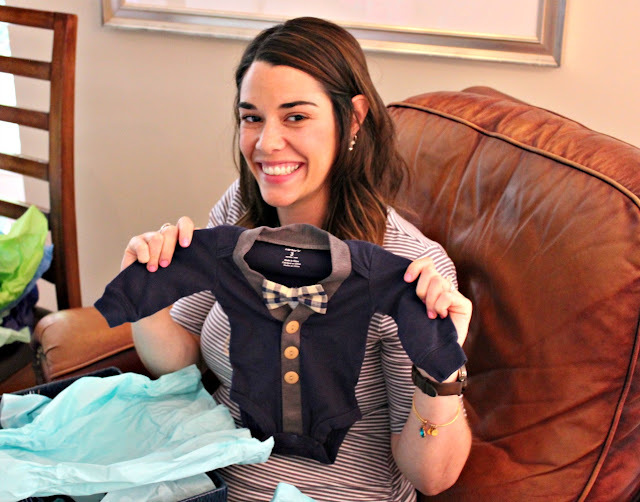 I love that baby cardigan & can't wait to see you so soon! Yes, that crab towel is totally deserving of that face. I'm pretty sure I make that face about every single piece of baby clothing I encounter! Ha! Sounds like a great shower! I can't deal with the precious little guy clothes. I'm melting. Also, "Eat Local?" Genius and hilarious. LOVE the onesie idea! So special and fun. That Blake is clever. You all should market that. Seriously. You should. And of course, you look Amazing!! !